Few tweaks that you can apply to make Torrenting fun again. If you are new to Torrent downloading, then chances you might suffer from having slower Torrent download are high. It’s really frustating to see your download peaking only around 10% of your total bandwidth. This handy little guide will help you through the rabbit hole with few clicks. Note : I’m gonna use uTorrent on Windows for this guide. There aren’t too much differences between other Torrent clients, be it on Mac or Linux. Just look for the bread crumbs and you’ll be home soon enough. Some people might favor using a Seedbox or VPN for this purpose, but for most user it’s not something i would really recommended unless you’re really into downloading a lot stuff. First of all, welcome to the Torrent Wonderland. Unlike conventional central server download where can you click on the download link, Torrent or more specifically, Bittorent, is a Peer-to-peer (P2P) distribution service where the users themselves do the actual file serving. This helps reducing the server and network impact when distributing large files, and since everybody is both sending and receiving, it’s much more efficient than everybody downloading from a single server. Since Torrent is accounted for 3.35% of all internet traffic around the world (as February 2013), most ISPs (Internet Service Provider) aren’t really Torrent-friendly due to its high bandwidth usage. There is no surprise if they throttlling (slowing-down) your Torrent download due to this sole reason. Fortunately, there are few ways that we can apply to avoid the throttling and making Torrenting fun again. Let’s start from the most basic part first, shall we? Step 1 - Keep an eye on Seeders/Leechers ratio. One of the main reasons why you won’t be able to finish the download is because lacked of seeders. And another main reason for having slower downloads is because of leechers. WTF are they anyway? Seeders are people who’s already downloaded the file and currently distributing it. Leechers are people who’s downloading the file from seeders. After you’re done with download, you too will become a seeder. To make it simple, look for Torrent that have more seeders than leechers. You’re more likely getting a better download speed. Don’t forget to seed at least the same amount of your download after you’re done. Selfishness isn’t going to help anyone in here. Step 2 - Open Up Your Ports. While this might be simple tweaks to apply, some users might be get confused. Use your flexibility skills to adapt accordingly over your environment. By default, most Torrent client will automatically configures itself through Universal Plug and Play (not to be confused with USB PNP) network protocol so it will work seamlessly for user. But it doesn’t hurt for us to customize this settings so it will work even better for our specific needs. 1. Randomize port each start. While this might be problematic for anyone behind a router or firewall, its really helpful to slip your way behind ISP throttling. 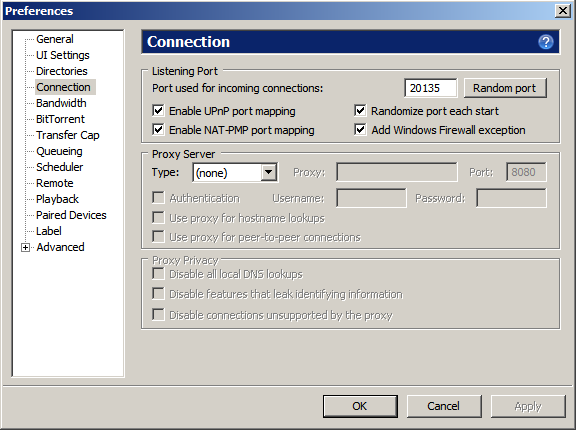 Most modern router will configure this automatically using UPnP (Universal Plug and Play network protocol), so be sure to enable it. 2. Firewall exception. uTorrent already configured itself into Windows Firewall exception, but if you’re using 3rd-party firewall like ZoneAlarm, you wanna make sure to create an exception for your Torrent client and port. Step 3 - Forcing Protocol Encryption. While this does not makes your Torrent session secure or anonymously, it will definitely make it hard for your ISP to see your Torrent traffic, thus preventing them from applying necessary throttling measurement. 1. Forced Outgoing Encryption and don’t allow incoming legacy. If your ISP doesn’t slow down your Torrent traffic, you’ll see a decrease in download speed due to your protocol restricted for peers with encryption only. But if you notice an improvement, then you’re already outplay your ISP. Allowing incoming legacy connections would only blow up your spoofing, so be sure to not enable it. 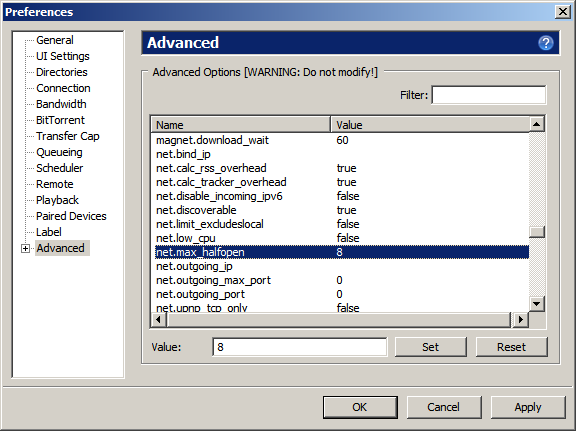 (Optional) Step 4 - Increase Half-open TCP connection (Windows only). By default, Windows only allows 10 outbound at a time to be made. These limits were introduced as a way to stop the spread of malware because they will try to connect thousands of addresses at a time looking for holes. This ended up preventing Torrent to connect to plenty of peers to speed up the downloads. By patching some system file, we’ll have this restriction removed and enable faster Torrent downloads. 1. Download the patch here, and follow the guide to alter the outbound limits. I would recommend nothing more than 150. 2. Open up your Torrent client, and look for anything related to half-open tcp connection. In order to reserved the outbound for rest of internet service like browsing, leave around 10% of your total half-open connection. That’s it folks, i hope you’ll enjoy your stay in Torrent wonderland. If you have any comment or question, do contact me and i’ll have this how-to updated accordingly.